The goal of this book is to motivate young women to be the “U” that God created you to be. What a powerful, inspirational message! In a world where people are constantly trying to be someone they aren’t, this message is right on time. Women especially need to be proud of who they are. It’s okay to be you. You are wonderful. This book helps women to see themselves as God sees them – beautiful. Everyone is beautiful in God’s eyes. True beauty lies within. True beauty comes from our heart; not what we look like on the outside. Each individual is unique. Natural beauty and uniqueness are emphasized throughout this book. Mary Mary encourages their readers to celebrate the joy of being a woman. 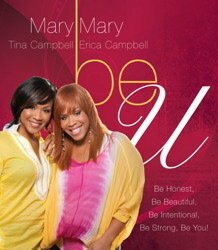 I really appreciate the message that Mary Mary is spreading. I think that everyone who reads this book will walk away feeling inspired and uplifted. Springtime is such a busy, exciting time for me. Spring cleaning, yardwork, and of course - The Race for the Cure. I look forward to all of these things with eager expectation. I love this time of year. Everything comes alive and so do I! The Race for the Cure is scheduled for Saturday, May 15 at 8:00 am. Are you ready? I began my training about two weeks ago and I am working hard to improve my time this year. My goal is to run a 9-minute mile. Yes, I said it. I have told the world my goal and now I am committed! The race is approaching fast. Now is the time to get ready. For training tips, you can visit http://www.runnersworld.com/. I highly recommend this site. I have used it for years as a guide for my training program. Team registration will close on Friday, April 23. To register for the race, go to http://www.komencolumbus.org/. My team's name is Team Nia. Everyone is invited to join my team. Not only is this a chance to contribute to a worthy cause, you can also work on your personal fitness goals. Register today!